We here at Things in Light love poetry. And New Mexico's literary landscape is steeped in the stuff. 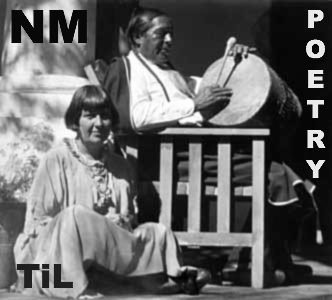 In celebration of National Poetry Month, TiL will present poetry by members of the exciting and diverse contemporary New Mexico poetry community. The sixth TiL NM Poetry entry provides a three-poem introduction to the work of poet, pin-up model, and photographer Ungelbah Daniel-Davila. She's also a journalist, filmmaker, and the publisher of New Mexico's only free, web-based rockabilly publication, La Loca Magazine. I thumb a necklace of keys to get inside his door. moment of a setting moon. and rising a slow, oily waltz. workingman dark in the dashboard glow of an FM station. your whiskey breath sweet as rotten fruit. Ungelbah Daniel-Davila is a poet, writer, journalist, filmmaker, photographer, pinup model and queen of all trades. She has been published in the American Indian Culture and Research Journal, Native People Magazine, and others. She holds a BFA from the Institute of American Indian Arts and her first chapbook, "Effigies II," will be released this year from Salt Publishing, UK. She is the publisher of New Mexico's only free, online rockabilly publication, LaLocaMagazine.com, and the owner of La Loca Linda Pinup-ology. She lives in Albuquerque with her kitten, Lady Marmalade, schnoodle, Oscar the Bandit, and fishie, Ralph the Rocket.